Red and orange - this makes a beautiful and delicious dish. 82 calories per serving. Dovetailing tip: Your beets are all ready cooked and sliced for the salad. Good job preparing them ahead of time! Step 1 Heat the oven to 400 degrees. Cut the greens off the beets, leaving about half an inch of the stems attached. (Save the leaves for sauteing later.) Clean the beets well, and toss them with 2 tablespoons olive oil and 1 teaspoon salt. Step 3 When the beets are done, carefully remove the foil. Let them cool, then peel them by slipping off the skins with your fingers. Cut the beets into one-fourth inch thick slices. Step 4 Slice the stem and bottom ends from four of the blood oranges. Stand the oranges on one end and, following the contour of the fruit with your knife, remove the peel and cottony white pith. Work from top to bottom, rotating the fruit as you go. Slice the oranges thinly, into 8 to 10 pinwheels, and discard the seeds. Step 5 Juice the remaining blood orange. Combine the diced shallot, vinegar, lemon juice, one-fourth cup blood orange juice and one-half teaspoon salt in a small bowl and let sit 5 minutes. Whisk in the remaining 2 tablespoons olive oil. Taste for balance and seasoning. 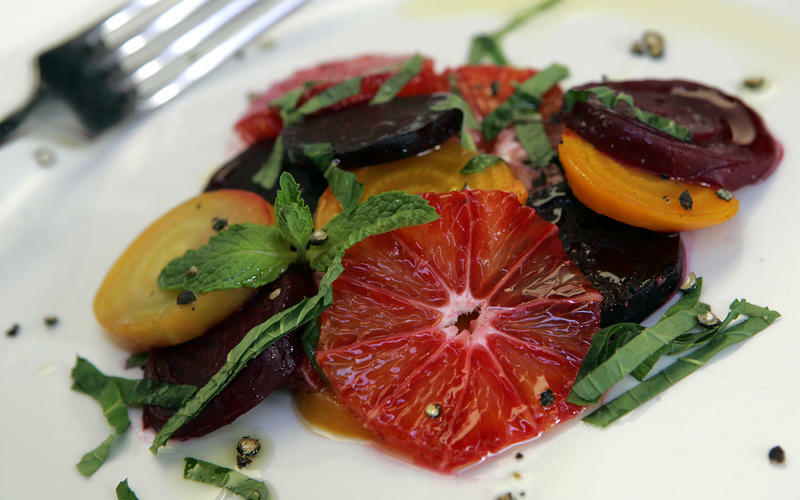 Carefully toss the beets in a bowl with half the vinaigrette and a sprinkling of salt and pepper. Taste for seasoning. Step 6 Place one-third of the beets on six chilled plates, loosely in a random pattern. Continue arranging the oranges and remaining beets, layering the ingredients, letting them intertwine but not pile up on one another too much. You should have a beautiful, natural-looking mosaic effect. Spoon the rest of the vinaigrette over the salads.